In honor of the upcoming New Year’s (and to use up a bag of black eyed peas and a couple of ham hocks languishing in my freezer) I decided to make Black Eyed Peas. And there is no better accompaniment to Black Eyed Peas than a my home-made Chili Sauce. 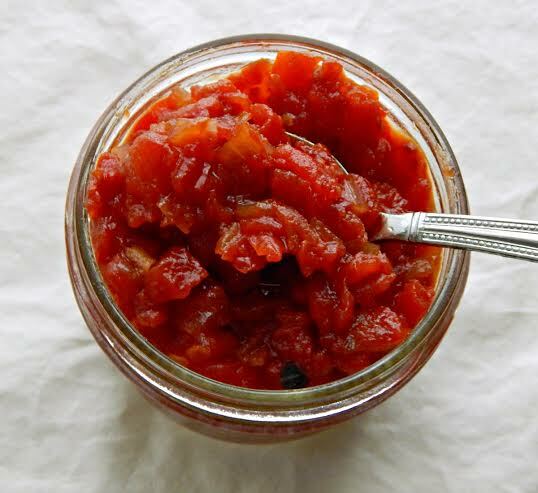 If you’ve never had a home-made chili sauce, this will blow you away. My son describes it as “overwhelming, flavors flying at you from all different directions – spicy, sweet and confusing!” And it is. Sweet, sour, and just a little hot, you’ll find a zillion uses for it. While I’ve used a Heinz Chili Sauce in my meatloaf topping and again in the old standby for Pulled Briskit or Shoulder, this Garden Chili Sauce is a whole ‘nother animal. You can’t even compare it to Heinz. Today, I cut back the recipe and used canned diced tomatoes since it’s (duh) December in Minnesota and I couldn’t come by decent tomatoes. That’ll teach me! But it was surprisingly good, just a little chunkier than usual due to the firmness of the canned tomatoes. This is a sauce, though, best (and least expensive) made in the summer with gorgeous home-grown tomatoes. If you don’t have your own, hit up a farmer’s stand or a farmer’s market. I have my own pickling spice that is excellent in this. Prepare 4 1 pint jars and lids by sterilizing in boiling water according to manufacturer’s instructions. Combine tomatoes, red peppers, onions, hot peppers, brown sugar and salt in a heavy non-reactive pot. Cook gently over medium heat for 45 minutes. Tie the pickling spices, mustard and celery seeds into a cheesecloth bag, add to the pot and cook over medium low heat until reduced by half, stirring occasionally to prevent sticking, about 45 minutes. Add the vinegar and cook another 40 minutes over low heat. Remove the spice bag and stir in the lemon juice. Pack the hot sauce into the jars, leaving a space 1/4-inch from rim; seal and process according to manufacturer’s instructions. Store in a cool, dry place; refrigerate after opening. Note: if you don’t wish to can this sauce, consider portioning out in Ziploc bags and freezing or reduce the recipe. This will keep for several months in the fridge. I’ll be taking Garden Chili Sauce to the Fiesta Friday 100 anniversary extravaganza, and I’m also co-hosting this event, so a big shout out to Angie from the Novice Gardener and Fiesta Friday for putting the event on and Steffi from Ginger&Bread, Suzanne from APugintheKitchen and Judi fromCookingwithAuntJuju for co-hosting, too. Stop by, say hi, visit and mingle and I hope to “see” you there! This entry was posted in Click here for Fabulous Food Posts and tagged Canning, Condiments, Frugal Hausfrau, Heritage Recipe, Hot Peppers, Peppers, pickles, pickling spice, Tomatoes. Bookmark the permalink. They’re touch and go where I live, too, but every now and then! That’s when I pick up extra…They make such a silky broth for the beans. I have never tried making my own chili sauce. This is such a simple and doable recipe! I think you’ll love it – it takes a bit of time but the flavor is so worth it! 🙂 Thanks so much for stopping by and commenting and Happy New Year!! Thanks much! It would go so well on so many things! I think a lot of those spices would be very familiar to you! Happy New Year’s! Oh there would be so many uses for this! Thanks, Virginia – we’re down, i’m afraid, to the last few spoonfuls! I shouldn’t have cut back the recipe when I made it this time…. This looks absolutely stunning and reads delicious! What a brilliant sauce- I can’t wait to get my hands on some tomatoes …. Thanks, Ginger! Here we are in January and it’s COLD – Here, it gets harder and harder to find fresh produce – or at least produce that looks good and doesn’t cost an arm and a leg so I’m already yearning for summer! Love the chili sauce. I am definitely going to make it! It is so versatile, I think I will be reaching for it with every meal! Thanks Sandhya – I had to tell my son he couldn’t have anymore because I wanted to take the last of it to my folks! I’m so mean to my son sometimes, haha! 🙂 But he was just eating spoonfuls of it! I am going to make a huge batch of it! Yum.. I can think of so many uses for this chili sauce. My tradition for New Years day is always pork, kraut and egg noodles. I have made black eyed peas a few times but I would be the only person eating them. Happy New Year. BTW what recipe plugin are you using? Hi Quinn, it’s called a shortcode and I think it was developed for wordpress but might work elsewhere. I’ll send it to you. It’s not perfect but better than what I was doing. All fields for recipe, time, difficulty, etc. have to be filled out for it to work. I’m really more of a pork, sausage and kraut person, too! Well, as you can imagine…lol!..but was served this once in the South when visiting my brother and became a convert! Thanks so much! It does just jump with flavor! Happy New Year! Absolutely wonderful. I think I will give the sauce a try: I have home canned tomatoes which I want to finish up and some peppers in the fridge. Home-canned would work very well! They don’t have all the crap in them that makes them firm so it will be a bit more saucy. Happy New Year’s to you! Love it, the chili sauce and black eyed pea’s. Great way to start the New Year!! Thanks Suzanne, the black eyed peas were a bit of a departure for this Northerner, but my Grandmother used to serve a chili sauce a lot like this and she was born and died in Iowa. I have one of Sheila’s Silver Palate cookbooks – goes back a few years! Thanks for the recipe and as you said it would be better to make in the summer when the veggies are fresh. Still looks delicious – thanks for bringing your homemade chili sauce to Fiesta Friday. I think they were iconic for their time! I long ago gave away my copies, and sometimes I wish I hadn’t! I just have far, far, far too many cookbooks,tho! We’re so spoiled with blogging, aren’t we, and all the gorgeous photos – of course, the youngsters have grown up with the internet and have never gotten used to reading recipes and imagining! Wow! I’m totally attracted to this beautiful red beauty…will bookmark this! Great sauce and love the idea of freezing some for future use! With all the vinegar in it, it will keep for weeks, perhaps months, in the fridge, too. Mine never lasts that long! !